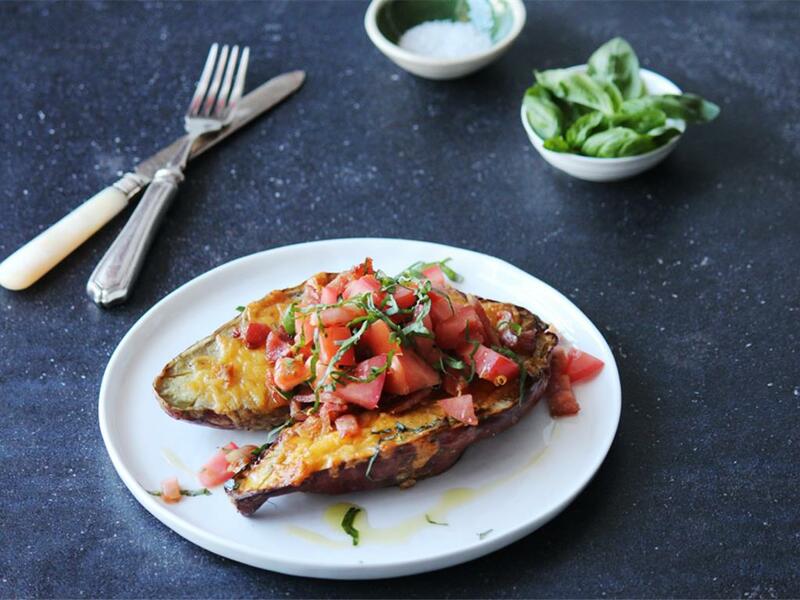 Roast sweet potatoes topped with melted cheddar, crispy bacon & a fresh tomato salad. Lemon: Using the fine side of a box grater, grate the peel to create zest, then cut in half and juice. Sweet potato: Cut the sweet potato in half lengthways, then make shallow diagonal slices in the flesh one way, and shallow diagonal slices the other way to make a crisscross pattern. Place on a tin foil lined baking tray, drizzle with olive oil and season with salt and pepper and roast for 30-35 minutes until soft and golden. Bacon bits: Place a dry pan on medium-high heat (add a drizzle of olive oil if you prefer). When hot, add the bacon and fry for 7-9 minutes until brown and crispy. Remove from the pan onto paper towels. 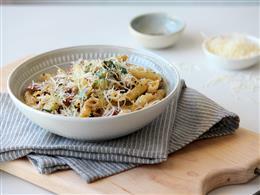 Cheese & egg mix: Add the grated cheddar and ¼ of the bacon bits to the egg and mix through. Grilled sweet potato: Top the sweet potatoes with the cheese & egg mix, turn the oven on to the grill and place back in the oven to grill for 4-5 minutes until the cheese is melted and golden. Tomato salad: Mix the tomatoes with the lemon zest and juice to taste. Drizzle with olive oil, season with salt and pepper, then slice the basil leaves and add them to the salad. 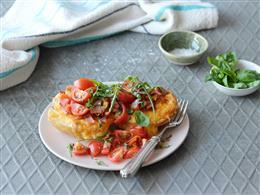 Serve the sweet potatoes topped with the tomato salad and the REST of the bacon. "Although it had a lot of starch it was delicious "